Teacher. Physicist. Prankster. Ladies’ man. Incomparably brilliant human being. Though not in the same pop culture stratosphere as some of his contemporaries, Richard Feynman is nevertheless one of the titans of twentieth century science. And he’s not too shabby a storyteller, either. His memoir Surely You’re Joking, Mr. Feynman gallivants with great aplomb across much of Feynman’s life, starting with his childhood in Queens in the depths of the Depression. As usually happens with preposterously smart folk, Feynman was a precocious child, skilled in radio repair, prestidigitation, and math. From there he attended college, figured out how to actually socialize with other human beings, later figured out how to actually socialize with women, lectured at universities far and wide, lived in Brazil, became a samba musician, deciphered Mayan inscriptions, won a Nobel Prize… oh, and helped invent the atomic bomb. Amongst a variety of other things. It’s actually kind of dizzying, and the memoir itself does jump around quite a bit. This has its plusses and minuses, as it keeps the book from devolving into “and then I did this, and then I did this,” but the changes in tone and subject matter can be breathtakingly abrupt. As befits the life of a man of such prodigious intellect and accomplishments, all these legends of scientific endeavor make what are often cameos: Watson and Crick, Oppenheimer, Bohr, Einstein of course. And these cameos almost always reflect brilliantly on Feynman, as some iconic scientific figure decides to take him under their wing, or recruit him to help with a problem, or just say nice things about him. 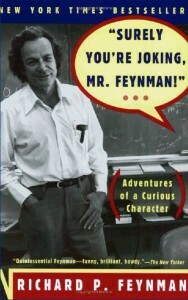 In fact, while much of the book boils down to the same basic anecdotal structure (that being “so then this one time I did this cool thing, and it turned out cool, and the whole experience was cool, and I’m kinda cool but it’s really about the science”), Feynman himself is disarmingly charming in a “I desperately want to share my enthusiasm for this super cool thing with you” way. One suspects that he would either be the best or worst cocktail party conversational companion that one could ask for, depending on one’s tolerance for that sort of gee-whiz charm. At the risk of basically repeating myself, I do feel the need to hammer home perhaps the most salient point of the book: this is a man who’s accustomed to being the smartest man in the room, and he’s been in some heavy rooms: MIT, Princeton, Caltech, and most impressively Los Alamos. However, in many of his anecdotes he comes across as more functionally human than your average polymath (or at least the prevailing cliche thereof). The book is rather light on hard science, which isn’t a bad thing. For instance, Feynman spends quite a bit more time recounting how he learned to crack the locks on all the filing cabinets at Los Alamos than he does talking about the Manhattan Project itself. Given the kind of hard science he lived and breathed, and given that I am far from scientifically inclined, I was grateful that I didn’t suddenly turn a page and find myself confronted with a series of integrals or a detailed explanation of deuterium decay. In a weird way, I have one of the worst tragedies in manned spaceflight to thank for my purchase of this book. Being an insomniac who can at least fake my way through the day on little sleep, I’m often up in the wee hours of the morning, when proper televisual entertainment can be hard to come by. However, one night I stumbled across a recent BBC docudrama about the investigation of the Challenger explosion, appropriately enough called The Challenger Disaster. Feynman (played by William Hurt, of whom I’m generally a fan) was asked to serve on the investigating Rogers Commission in sort of an Emeritus Smart Guy way, and he’s portrayed as the only straight shooter on a panel of bureaucrats, the only man interested in the Science of the tragedy, the man who eventually discovered the O-ring failure that cost seven astronauts their lives. Aside from being fascinating in its own right, the movie pointed me in the direction of Feynman’s various memoirs, though ironically this one ends several years shy of the events depicted. I haven’t yet picked up Feynman’s other memoirs, as I have a Pile of Shame you could build a siege engine out of, but I have every intention of doing so. Surely You’re Joking, Mr. Feynman is a breezy, strangely addictive tale of one man’s journey through science and humanity, as often as those two can be at cross-purposes. If nothing else, the guy lived one hell of a life. Share the post "On Atomic Bombs, Samba Music, and Preposterous Intelligence"